1951. Winthrop Sargeant, in an article for the November 8, 1958 issue of The New Yorker, observes that like all Avedon models, Dovima is an instinctive actress, and enters into the business of building up a fictitious public personality as a femme fatale with a fervour that is both disarming and wholly at odds with her extremely conventional notions of conduct. She is actually a devout Catholic and a homebody. The smartest and most useful of cardigans – knitted in natural linen yarn. There’s no neater sweater for day, no prettier one for night. By John Miller. About $35. Lord & Taylor; I Magnin. Sandor jewelry. 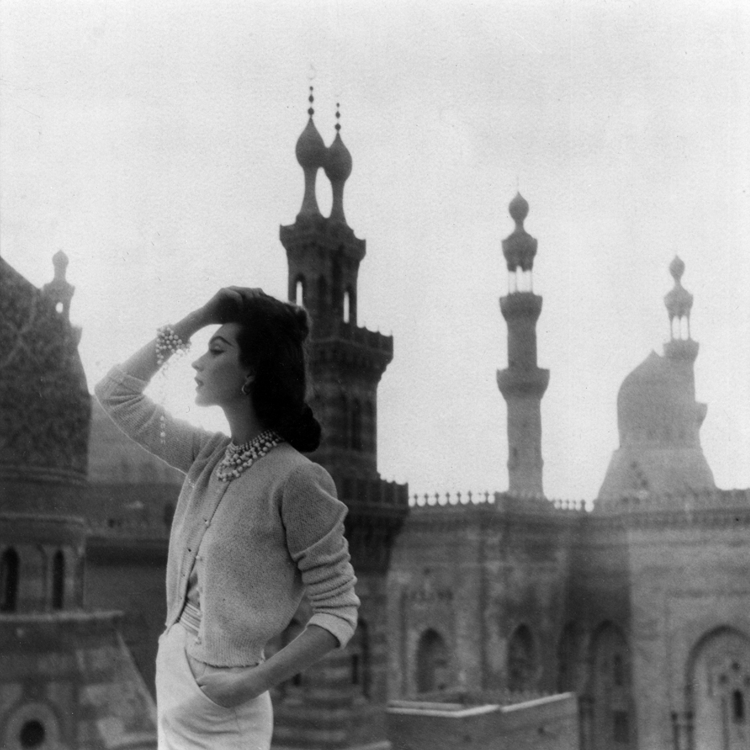 Background: the mosque of Mohammed Ali, the largest and most impressive in Cairo.